In your face last week! I got out and ran this week! Three times! Hurray for me! There were two goals to this week. The first was to ease back into the habit of running regularly, which I’d let slip a bit in the weeks following the half (I’d blame post-race blues, but in reality it was just laziness), and the second was to give this new Hal Higdon app a whirl to see how I got on with it. The Training Plan (it’s definitely worthy of capitalisation) will call for four days of running each week: two short runs, which progress from 3 miles to 5 miles over the 18 weeks; a mid-week “sorta long run”, which progresses from 3 miles to 10 miles; and one long slow run, which progresses from 6 miles to 20 miles – yikes! I’ve already decided to start two weeks earlier than scheduled to build in a couple of buffer weeks in case I want to repeat any of them or suffer mild set backs, so The Plan properly starts on Monday 8 December. This was Week -2, which is, I suppose, starting The Plan four weeks early, but it’s more about testing my pacing and getting my mind in the right place than sticking rigidly to a set plan at this point. 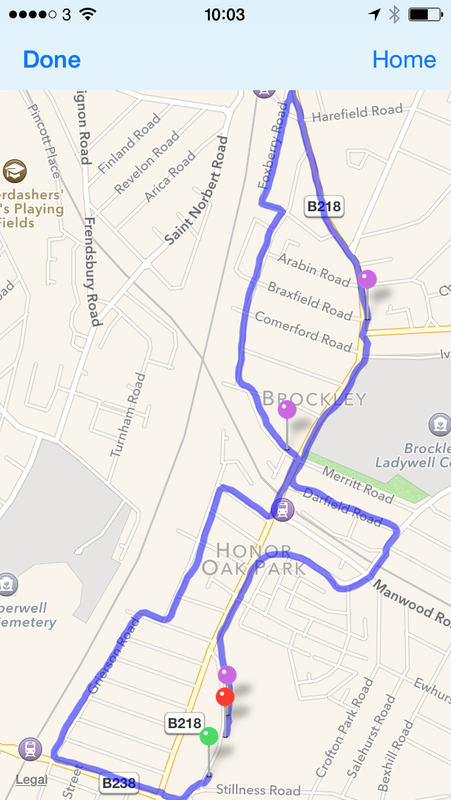 Anyway, this week I ran two of the shorties and the long one from Week 1 and I’m feeling pretty pleased with myself. 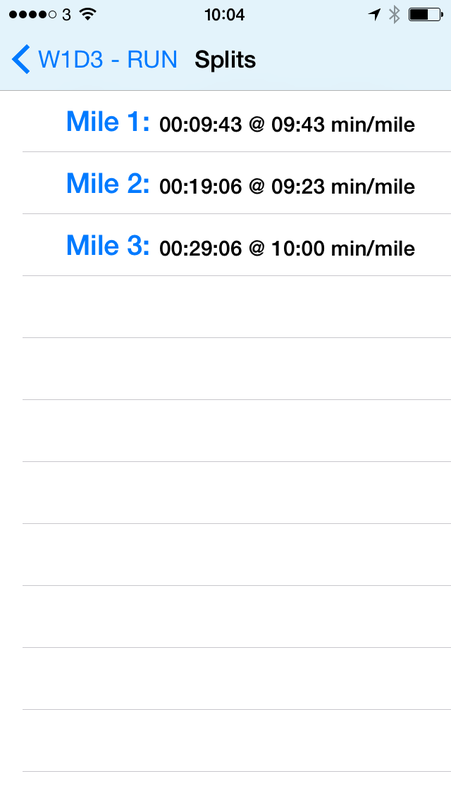 The three milers both went well and I was happy with my pacing for both of them, which improved on the second run (though this may be because the first one included a couple of the local hills and the second was almost all on the flat). I had some issues with the app during the long run this morning, so I’m not entirely sure what my final distance was, but I ran for an hour and was averaging around 10:50/mile, so I was probably about half a mile short of the six miles. I don’t feel too bad about missing the goal and the important thing is I learned a few things about how the app works! Where I fell foul today was around the pause button. I stopped briefly to have a quick chat to my sister (who was riding her bike in the park where I was finishing up my run) and paused the app while doing so, but forgot to re-start the app when I started up again. Idiot. I’m so used to the Nike+ app auto pausing and re-starting that it just slipped my mind. I do have the auto pause/re-start switch on, but it didn’t kick in so I don’t know what’s going on there. I’ll have to play around with it to see if I can work it out – it will be more important on the longer runs which will bring me through road crossings and other obstacles and having an auto pause/re-start is really useful to keep a reasonable track of pace. Oh well, this is after all why I wanted these early weeks. Get used to the app and iron out any issues so that when I start The Plan proper I can focus just on that. Other things that went on this week: still reading the Murakami book and really enjoying it; saw Interstellar (finally!) and absolutely LOVED it; bought some lovely new decorations for the upcoming festive season and I’m starting to feel all Christmassy already – lovely! And the best news is that work should now start to settle down a bit for the remainder of the year – at least there will be no more overnight trips for a while – so this will help me get right back on track with getting up early and getting out running! So this was going to be this first of my countdown weeks to the training plan, AKA Week -3. The idea of my countdown weeks is to get myself warmed up again into running at least four days a week and getting back on the strength/conditioning bandwagon. Great idea, right? Sounds like it would work, right? Unless you catch a massive lurgy and end up doing NOTHING! Which is what happened this week. I even lost my appetite for a day and that never happens (I was convinced I was actually dying at that point, obviously). Still, at least this has happened right at the start of my training – before it’s started, even – so with a bit of luck I won’t have to deal with too many more set backs of this sort. And to help keep the motivation stoked to the maximum, I started reading What I Talk About When I Talk About Running, by Haruki Murakami. It’s been on my list for yonks and it feels like the perfect time to read it. I’ve just started it, but really enjoying it so far. 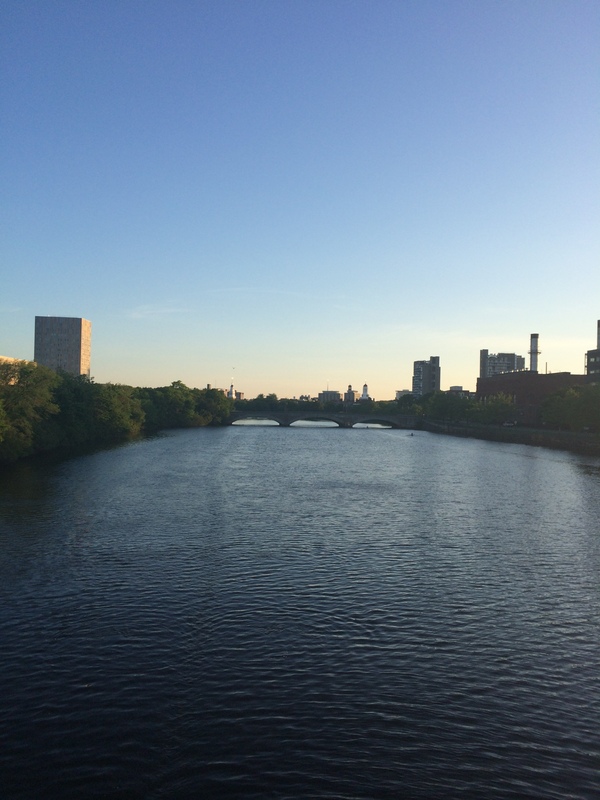 Of course, much of this is to do with the beautiful way that Murakami writes, but also it’s because he describes running along the Charles river in Cambridge, Massachusetts in one of the early chapters. I’ve been lucky enough to travel there a couple of times for work and ran along that very jogging path myself in June this year. Lovely! Ah, beautiful running memories. Anyway, I shall report back once I’ve finished and let you know what I think. Have any of you read any good running books – anything inspired you to start, continue or get back into it? Born to Run is the one that people often talk about, but I’m not really in to that whole barefoot thing and it has always struck me as a bit evangelical on that subject. Earlier this year I read Running Like a Girl by Alexandra Heminsley, which I really enjoyed and is the book which convinced me that I COULD do this marathon thing if I put my mind to it, which can’t be a bad thing really. Would love to hear any other recommendations if you have them. Next week there will be running to update on. I promise! OK, so I’ve spent what feels like a ridiculous amount of time looking at loads of different training plans from all sorts of sources. The sheer number and variety is a bit daunting and baffling really – how do you know if you are picking the right one? Just a handful of the ones I looked at were from Runner’s World, Bupa, Asics (which I really liked) and very nearly went with one of the plans on the London Marathon website. In the end though, I have decided to go with the Hal Higdon Novice 1 programme. I’ve heard a lot about Hal Higdon’s plans over the years and about how good they are, then at last week’s marathon workshop organised by Together We Can one of the speakers was someone who ran the VLM this year and used a Hal Higdon plan. I’d been meaning to check them out and this really helped swing it. The main thing is it is a plan that I can actually see myself sticking to and will get me round the course. Both novice plans looked good, but I decided on the Novice 1 because it’s my first marathon and the aim is to finish! I decided to splash out and get the app for my phone – I used the BlueFin apps to train for my first 5K and 10K races and they worked really well for me, so it made sense to follow through for my first marathon. If you are looking for training apps I do recommend them. So, we have a plan! It’s an 18 week plan and the official start date is 22 December, but I think I’ll get cracking on it a bit earlier to build in contingency time for illness/injury/can’t be arsed pitfalls. At the moment it’s all about keeping my fitness base levels maintained, but I’m now kind of looking forward to getting properly started. Apart from being flippin’ terrible at writing my blog regularly, I’ve had a great summer of running and will very soon be kicking off my training for the big one – the Virgin London Marathon 2015! Eeek! So I’m back, to write about my training experience, to share my nerves and excitement in the run up to the race, and to get back on the blogging bandwagon once and for all. And of course I’ll be promoting my fundraising efforts for the Evelina London Children’s Hospital. I did run the Royal Parks Half Marathon, which was hard going (thanks to the aforementioned falling behind in my training) but I finished it and came in with pretty much exactly the same as last year – result! 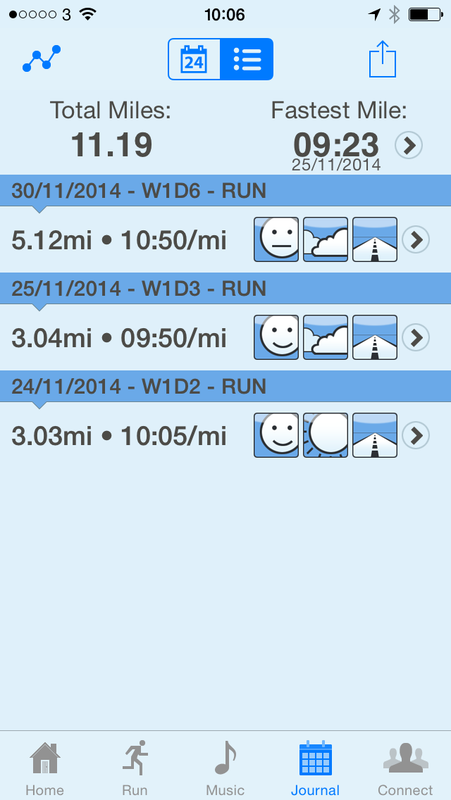 As you can see, I had some problems with my training for the half, which was mainly due to struggling with motivation. I’m not sure what caused it, but I found it quite difficult to motivate myself for the weekday runs – I was absolutely fine getting out for the long runs at the weekend, but those shorter sessions were a real mission and I think my overall race experience really suffered for it. My main lesson from this has been not to neglect those runs. It might only be 6 miles here or 4 miles there, but it all adds up. If I have similar issues in the future I’m going to drag myself out for a minimum of 3 miles to at least get something in the legs. So the reason for starting this blog back up again is because come December I’ll be starting the marathon training in ernest. I’ve kept up a reasonable level of running since the half (after giving myself a week or so off) and have been keeping my long runs at around 7-8 miles. My current obsession is scouring the interwebs for training plans – I still haven’t settled on one, but I do like the look of the Hal Higdon Novice plans (can’t decide on Novice 1 or Novice 2) and I expect I’ll settle for one of those eventually. It’s amazing how many plans there are out there and quite overwhelming in a way – I’ve never been good when faced with too much choice! I’ve also entered the Silverstone Half in March 2015. All the plans seem to recommend a half race around 6 weeks before the marathon itself, so Silverstone was perfectly timed. I’m not really sure what to expect with that one – and it will be my first non-London race, which will be a nice change. Not expecting it to be particularly inspiring scenery and I’m a bit worried about lap boredom, but it was either that or the new North London Half and I’d rather run round in circles in Northampton than go to North London! I’m joking of course (I’m not joking). Juneathon day 21 – I’m back! Juneathon day 17 – Take one. Take two. Take three! The road to the 2015 Brighton Marathon and whatever comes next . Once a runner, always a runner. More effort, faster times. Maybe. I was on a journey to my first half marathon and I did that June 7, 2015! Now I just want to try and stay motivated and even after 15+ years of struggling with eating healthy, stay on track with that. I want to keep doing it by inspiring others and encouraging people to live their happiest, healthiest life.